The name for this apple is derived from its large size and yellowish-orange color. It originated in 1800’s in the orchards of S. Lyman of Manchester, Connecticut and was first recorded in 1834. It has long been a popular apple in the South sought out for its culinary qualities. It is excellent for baking or canning, but less desirable for fresh eating. 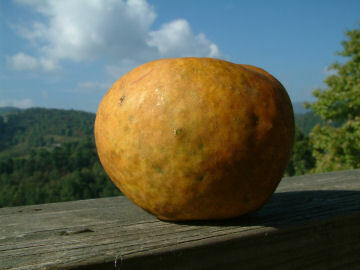 Fruit is large to very large with tough, smooth skin with patches of russet, occasionally showing a brownish-red blush. The yellow flesh is firm, crisp, juicy, and very sweet. Ripens October or later.